The Southeast is the epicenter of the attempt to revive nuclear energy. Now it may also be the nuclear waste epicenter as well. 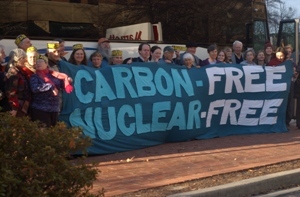 The federal Blue Ribbon Commission on America’s Nuclear Future met in Augusta Georgia on Jan 7, 2011 and heard nuclear boosters in the area of the Dept of Energy’s Savannah River Site (SRS) that they are volunteering to take the highly radioactive waste formerly slated for Nevada.Nuclear boosters want to build an “Energy Park” at SRS with a primary focus on waste storage and reprocessing or recycling of highly radioactive fuel waste, most of which is generated by commercial nuclear power reactors, as well as some from defense sources. Such a plan would trigger MOBILE CHERNOBYL. NIRS Southeast is situated at the Nuclear Crossroads where I-40 and I-26 meet in Western North Carolina; 30 years ago a site in Leicester NC called “Sandy Mush” was identified as a possible nuclear waste repository site. People here are launching a campaign to oppose nuclear shipments through, or to our mountains.